Victorious Delhi captain, Shreyas Iyer, has been named the MAN OF THE MATCH. Says that this comes as a really satisfying win after 3 losses at home. Stresses that it was not an easy wicket to chase and lauds Dhawan for digging in. Admits that this is not a track which would suit his batsmen as most of them play on the rise and want the ball to come on to the bat. Says that he took up the responsibility to bat deep and stay till the end. Praises Sandeep Lamichhane for stepping up a gear and says that Amit Mishra's experience is helping the Nepalese. Lauds Shikhar Dhawan's positive approach and wants all his top order batsmen to be courageous. Hopes that in the coming games, the rest of the top order takes up the responsibility of batting till the end. Shikhar Dhawan is up for a chat as well. Smiles and says that it's important for them to win this game as they now get closer to qualify for the knockouts. Wants to get much better than today and keep improving. Tells that they wanted to utilize the first six overs as the wicket was on the slower side and hitting the softer ball would have been tougher. 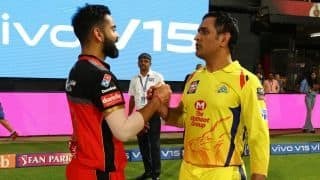 Mentions that he just focuses on the process and as an experienced player, he keeps talking to his boys in the middle and tries to make sure that they don't lose wickets under pressure. Punjab skipper, Ravichandran Ashwin, says that 163 was just below par due to the kind of dew on the outfield. Feels that they lost too many wickets in the middle which hurt them. Adds that Mujeeb getting injured was a setback for them. Terms it unfortunate that they didn't have enough runs on the board. Admits that they failed to tighten the noose and kept leaking boundaries here and there. Praises Shreyas Iyer for his knock and cheekily comments that Iyer knew that his wicket could have led to another collapse. Lauds Harpreet Brar's efforts as well and considers him one for the future. Have to feel for the Punjab bowlers. They struggled with the persistent dew and eventually ran out of steam. Mohammed Shami was the only bowler who was consistent and ended up with figures of 4-0-21-1. The rest simply could not adjust to the dew. It was the Dhawan-Iyer show for a major part of the chase with the 92-run stand taking care of Punjab's bowling. With the dew around, the bowling was not that great and the duo took full toll. Shikhar continued his good return to form, with his third 30-plus score in the last 4 innings. 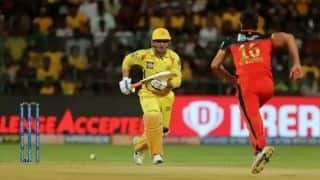 But as has been seen in the past, the hosts fell on the slippery road of collapse, losing 5/40 in 32 balls before skipper Iyer shepherded them through. To be honest, he kept his cool during the choke but was denied much strike. Almost making a habit of choking, are Delhi, aren't they? Another last-over finish. Didn't seem so when Delhi were 116/1 needing 48 under 7 overs. But Dhawan's wicket did set the cat free amongst the pigeons before caretaker Iyer took care that there was no brain fade. Phew. The match ends. Saturday is done. Another nerve-wracking double header. In the end, Delhi, who should have won, ended up winning but not without nearly losing it. 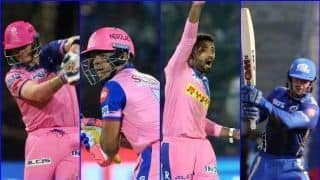 End of over 20 ( 12 Runs )Delhi Capitals 167/5 Shreyas Iyer* 60(51)Sherfane Rutherford 2(2) 19.4Sam Curran to Shreyas Iyer. FOUR, FOUR! DELHI WIN BY 5 WICKETS! Curran lets in a short of a length ball on middle, Shreyas gets on top of the bounce and hammer-pulls it to deep mid-wicket for the winning runs. A rare win at home for them this season. 19.3Sam Curran to Shreyas Iyer. 2 runs, Back of a length delivery on off, Shreyas Iyer tries going over the leg side but it takes the outer half of his bat and flies over extra cover. Good for two runs. 3 needed off 2 balls. 19.2Sam Curran to Sherfane Rutherford. 1 run, Bang! Curran delivers a length ball on off, Rutherford hammers it over the bowler's head and Miller moves swiftly across to his left from long off to stop the ball. The striker, who was standing and admiring his shot, has to cross for a single. 19.1Sam Curran to Shreyas Iyer. 1 run, Back of a length delivery on off, Iyer stays back and works it through mid-wicket for a single. End of over 19 ( 5 Runs )Delhi Capitals 159/5 Shreyas Iyer* 53(48)Sherfane Rutherford 1(1) 18.6Mohammed Shami to Shreyas Iyer. 1 run, Very full and on middle, it's knocked down to long on for a single. Shreyas retains the strike. 18.5Mohammed Shami to Sherfane Rutherford. 1 run, The batsman has flicked the ball off his pads. They pick up a single. Sherfane Rutherford walks in at number 7, replacing Axar. 5 wickets down for Delhi Capitals. Out batsman is Axar Patel 5 wickets down for Delhi Capitals. Out batsman is Axar Patel 18.4Mohammed Shami to Axar Patel. out, 1 run, OUT! Axar Patel is run out! Hang on, hang on, this evening surely is not going to end in a straightforward manner. We will get some more thrill. Good length ball on middle and leg, Axar glances it behind square leg and wants the second run. But while turning back he collides with Shami and as a result is very late in reaching to the other end. The throw comes nice and straight to Rahul who does the rest. Shami is gesturing that it was not intentional from him and the replays confirm the same. The bowler was walking in his line and never tried to get in Axar's way. Still Patel is furious as he returns. Axar Patel walks in at number 6, replacing Ingram. 18.3Mohammed Shami to Colin Ingram. out, OUT! Bowled 'em! Shami bowls it full and straight in the line of the stumps, Ingram skips down the track to play a big shot but fails to connect. The stumps are shattered and 9 needed off 9 at this stage. 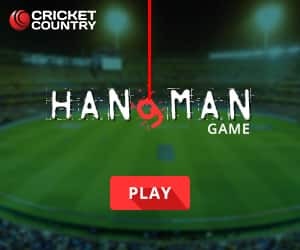 18.2Mohammed Shami to Shreyas Iyer. 1 run, Fifty! Short in length and on off, pulled in front of square leg for a run. 12th Indian T20 League fifty for Shreyas Iyer. 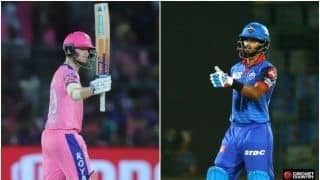 Skipper Shreyas Iyer‘s 58* off 49 balls and senior pro Shikhar Dhawan‘s 56 off 41 balls helped Delhi Capitals break the rut of losing matches at home with a canny run chase at the Feroz Shah Kotla in Match 37 of IPL 2019 against Kings XI Punjabon Saturday. 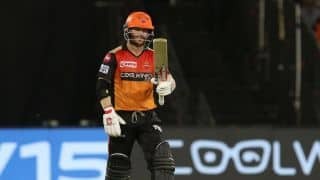 With a five-wicket win chasing down 164, Delhi consolidated their third spot in the points tally and claimed their second victory at home in five outings. KXIP did well to post an above par total, thanks to Chris Gayle‘s 37-ball 69; but their bowlers, despite having three front line spinners in the attack, failed to create any real opportunity. After the early loss of Prithvi Shaw for 13, his sixth straight score of under 30 when Dhawan bailed out on him on a quick single. Mandeep Singh hit the bullseye from covers and Shaw had to depart. But Dhawan was unperturbed and motored along with another innings with intent. He was off the mark with a four of Sam Curran and then added two more off two consecutive balls off Hardus Viljoen. Debutant Harpreet Brar got the taste of IPL when his first ball was hit straight over his head by Dhawan for a six as 17 runs came off it. By the end of the powerplay overs, Delhi were at a comfortable 60/1, with asking rate at 7/42. Skipper Iyer and Dhawan played in a smart manner, rotating the strike well and find the gaps in the field to drive Delhi further. The duo’s association of 92 runs came off just 62 balls with Dhawan scoring his 35th IPL fifty. 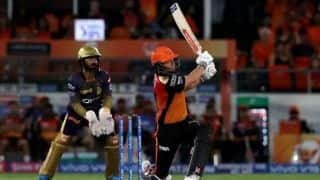 He also become the first batsman in the league’s history to score 500 fours in the IPL, but he fell to Viljoen in the 14th over, undone by a leg-cutter and went through his shot a tad early. 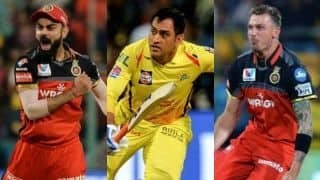 Ravichandran Ashwin took a tumbling catch to bring KXIP back in the game and with Rishabh Pant once again falling to a reckless shot – a wild hack off Viljoen to depart for six, DC fans were reminded of their team’s past capitulations in the tournament. Colin Ingram added crucial runs in the death overs with 19 off nine, but Delhi stuttered losing Ingram and Axar Patel in quick succession. 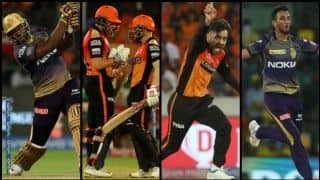 With six off six needed, Sam Curran, KXIP’s hat-trick hero against Delhi in the previous meeting between the two teams was failed to recreate the magic as Iyer and debutant Sherfane Rutherford took their team home.